I haven’t been a very active blogger lately. Sometimes you find yourself drawn in the every day life and at the end of the day the only thing you want to do is to get some sleep. I will try to manage my time better. Usually on weekends I like to cook things that I have never tried before; or give a new twist to an all time favorite but without spending the whole day in the kitchen. It’s the weekend after all! So when I saw this recipe on the May issue of Food and Wine Magazine, I knew I would give it a try. It looked mouth watering on the picture, the recipe seemed simple and quick to make and it was a healthier approach to the popular Meat Loaf. So Mini Chicken Meat Loaves were going to be our Sunday lunch. Chef Sandro Gamba served it with red pepper sauce and wild rice but not being in the mood for a sauce, I decided to serve it with braised lentils and roasted tomatoes, which worked very well. The use of sour cream, or cottage cheese in the initial recipe, keeps the chicken meat loaf moist and because chicken is leaner and higher in protein that ground beef, you will gain in nutrition and your waistline will thank you too. Heat the oil in a skillet. Add the carrots, celery, garlic and the onions; season with salt and pepper. Cook over moderate heat until, stirring, until softened, about 10 min. Let cool. In a large bowl, mix the chicken with the vegetables and the rest of the ingredients. Season with salt and pepper and knead until blended. Divide between the prepared pans. Bake in a preheated 400F oven for 30 min. 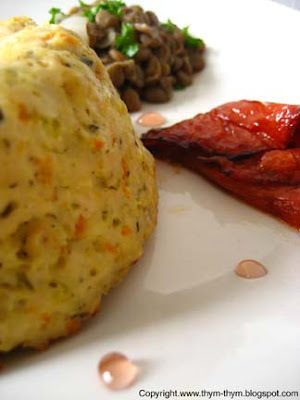 Serve with braised lentils and roasted tomatoes. Dans une poele, faites chauffer l’huile d’olive. Ajouter la carotte, le celeri, l’ail et l’oignon. Faites cuire sur feu moyen jusqu'à ce qu’ils deviennent tendres, environ 10 min. Laisser refroidir. Dans un grand recipient, melanger la viande avec les legumes et le reste des ingredients. Assaisonner de sel, poivre et petrir jusqu'à ce que le melange soit homogene. Distribuer entre les moules individuels beurres et faites cuire dans un four prechauffe a 200C pendant 30 min. Servir avec des lentilles braisees et des tomates roties. Qu'est ce que le panko ? Sinon ,cela me tente car j'ai gardé un très bon souvenir d'un meat loaf . J'adore les faires en ptrites portions. Je note ta recette, excellente! - Merci beaucoup Claude. Cette recette est fraiche et facile a faire, ideale pour cette periode de l'annee. Je te la conseille. Bien que je sais que tu y apporteras ta touche perso. - Thanks Lis. Especially after your Martha's crepe cake, we should really eat healthy if we want our summer clothes to fit!! - Le Panko Lili est une chapelure japonaise. C'est tres bien que tu me l'aies demande. Je vais le specifier tout de suite dans la recette. - Tu as raison Helene. C'est plus joli en portions individuelles. I like the idea of mini loaf esp I only have a small family. Rose, just hope you have a relaxing time! 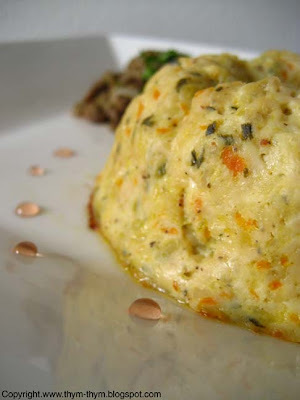 Beautiful, mini meat loaves are the perfect thing at our house and I should give chicken a try. Merci Rose , pour l'explication . Je ne sais pas si je vais rouver cela à l'épicerie Japonaise à Paris . Ps : désolée si ton comment s'est perdu ...Décidement ! - thank you very much Gatinna for your nice words. Really appreciate it. -Thanks Tanna for the welcome. You should give it a try with chicken.